The Tenant File exports to Quicken or QuickBooks! Here’s another handy option to make your life easier. Tenant File gives you a property management program that can export checks from any date. 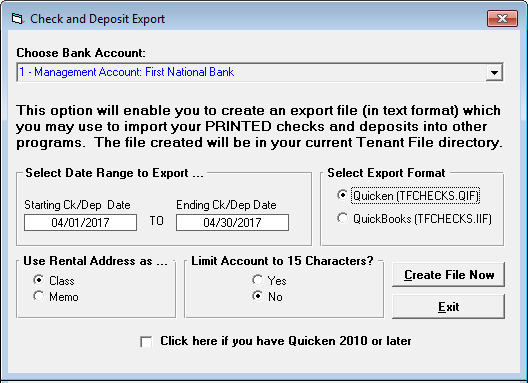 Checks printed in Tenant File can be exported to Quicken or QuickBooks and added to your office accounting or personal portfolio. Tenant File does not require that you use Quicken or QuickBooks, but if you rely on those programs, you will be able to integrate your records with a few keystrokes. Just supply the date range to export and click Start to create a file you can then import into the other program. Choose to insert data in the Memo field or within a specific class. Make your accountant’s life easier with the same document, exporting data in a format ready to use for filing taxes. Note: Not all versions of Quicken and QuickBooks may support these export formats.